Street sweeper shown used by Geneva Airport and Kew Gardens. The standard features alone, on this impressively designed street sweeper, elevate this street sweeper above the rest making it a popular choice for the serious user throughout the whole of the UK and mainland Europe. 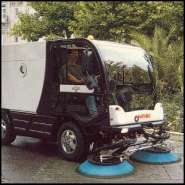 This innovative street sweeper and scrubber is utilised by such well known companies and municipals such as Kew Gardens, Kensington Gardens, Geneva Airport and the City of Nice in France. These street sweeping machines have excellent sweeping capabilities and designed to have four wheel steering maneuverability. The sweepers features several options and combinations of brushes. The low noise level ensure that the cleaning of pavements, paths and roads give minimal disturbance. In the mainland UK, practical demonstrations of the street sweepers are possible and very easy to organise.